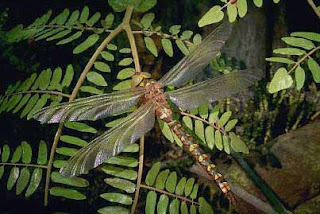 Life Before the Dinosaurs: Meganeura. ... also, and, as always, Aaugh! My "word verififcation" was "buggrati," by the way. You oughtta get one when you get your driver's license, Art. I've never heard the term "griffinfly" before! It seems good to know. And that first picture is amazing-- you can see all the wing veins! Can a griffinfly go slytherin?